pH controls is essential for stimulating vigorous plant growth. The pH scale measures acidity or alkalinity on a scale of 0-14. Below 7.0 the pH is acidic. Above 7.0 , the pH is alkaline. 7.0 is nuetral. 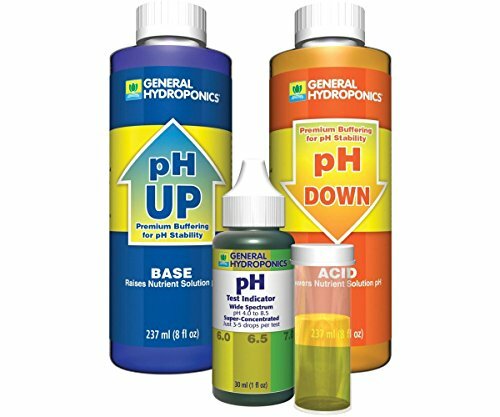 The best pH for general plant growth is in the range of 5.5 to 6.5, slightly acidic.Nutrient solution that is too high (basic) or too low (acidic) cannot be properly asbsorbed by plants. Incorrect nutrient solution pH can cause slow growth,sickly plants and low yields. Includes pH Test Indicator tube:fill a test-tube halfway with nutrient, add a few drops of pH Test Indicator, and observe the coloration of the liquid in the vial. If you have any questions about this product by General Hydroponics, contact us by completing and submitting the form below. If you are looking for a specif part number, please include it with your message.